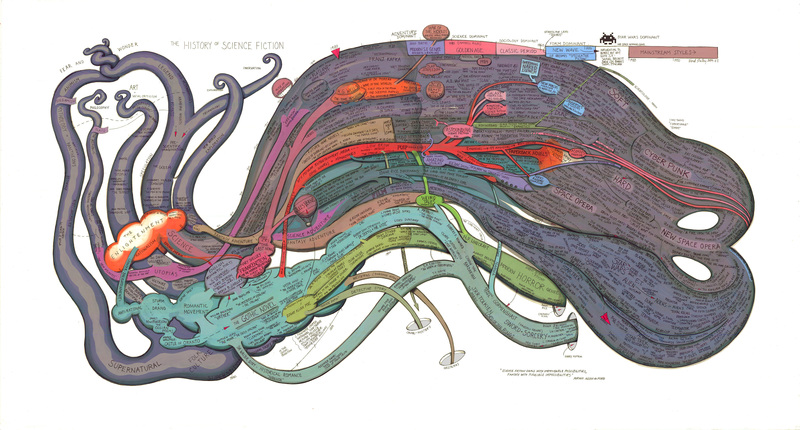 We began this series earlier this year with an indepth look at Science fiction and the history behind the genre, and so far we have waddled through many different genres that have incapsulated our hearts in many different ways. What about a genre that incapsulates not only us…but other genres? In today’s installment we are going to take journey through the life and body of Speculative fiction which in more recent years has become the umbrella term for many of the world famous genres like Science Fiction and Fantasy. So grab a seat and get comfy, cause its about to be a time! Speculative fiction made its world debut as another term for Science Fiction in 1947 for the editorial piece in The Saturday Evening Post by Robert A. Heinlein. In a later piece, Heinlein explicitly stated that speculative fiction did not include fantasy. Although Heinlein is considered the creator of the term, there has been discovery of previous citations where the term was used dating back to 1889. First applied to genre studies by Brian Attebery, a fuzzy set is a category defined not by clear boundaries but by resemblance to prototypical examples and degrees of membership: from being exactly like to being somewhat or marginally like. The blanket–or umbrella meaning came into play when the need for a term that enveloped a broad range of narratives that overthrew the post-Enlightenment mindset in the late 1990s. According to writer Marek Oziewicz, It was decided that the term needed to be one that “had long excluded from “literature” stories that departed from consensus reality or embraced a different version of reality than the empirical-materialist one.” Speculative fiction arose to this challenge and became a tool to help take down the bias of Western culture and instead raise up awareness of literary pieces that imitate reality and those that sought out to rebuild and recover the human sense of awe and wonder. One of the traits of speculative fiction that make it so hard to define is its general flexibility of non-realist genres. It groups together diverse forms of fiction that operate across different mediums and platforms for the sole purpose of mirroring and shining light on their cultural roles. What do you love about Speculative Fiction? Any Recommendations? Very cool new series! I’ve read your first three recommendations within this genre, I’ll have to check out Dune! The closest I’ve got to this is steampunk. I’ve enjoyed the ones that I’ve read, but not read any recently. Fantasy and Sci-fi are two of my top 3 fave genres! ILLUMINAE IS AMAZING AND I WILL DIE ON THIS HILL! I have loved every single rec you posted at the end. ALSO. THIS HAS BEEN MY FAVE IN THE SERIES SO FAR! [Seriously, I didn’t even know what Speculative Fiction was/never heard of it] Thanks so much for another amazing and informative post! YAY! I’m super glad you are enjoying these! I was teetering with this one if I should post it or not, but you made me happy I did! Thank you! Of COURSE Heinlein popularized the term, hahaha! I love speculative fiction so much, narratives dealing with humanity and the possible futures are my favorite for me to read and watch. Great post!!! I’ve always thought that spec fiction does include alternative worlds or situations that could possibly exist .? It does! I have it listed under subgenres within spec fic as Alternate/Parallel Universe. And according to Atwood in the history section, Spec fic does include situations that could possibly exist as she defines her dystopias as such. In the context of Speculative Fiction being solely another way to describe Science Fiction–no. So Spec fic as a blanket/umbrella term it does in fact include both situations that can and cannot exist. Since the umbrella covers Scifi and Dystopia among other genres that uses that theme.